"This carrot cake is worth its weight in gold! It always gets compliments!" Preheat oven to 350 degrees F (175 degrees C). Grease and flour three 9-inch pans. In a large bowl, stir together the flour, baking powder, baking soda , salt and cinnamon. Add the sugar, oil and eggs; mix well for 1 minute. Stir in the carrots, pineapple, walnuts, and coconut. Divide the batter evenly between the prepared pans. Bake in the preheated oven until a toothpick inserted in the center of each cake layer comes out clean, 35 to 40 minutes (one layer may be done sooner than the other). Cool in pans for 10 minutes before inverting onto a wire rack to cool completely. To make the frosting, beat butter and cream cheese until smooth. Mix in confectioners' sugar at low speed until combined; beat until fluffy. Stir in vanilla. For an extra touch, sometimes I add a little lemon juice to the frosting, about 1 teaspoon or to taste. I have been told that this tastes like cheesecake on top of the carrot cake--the best of both worlds! oh yes, this is absolutely delicious. My only change was to reduce the amount of coconut to 1/2 cup. This is now the only carrot cake I shall make. Thanks for sharing with us! Very easy and delicious. My first time making a cake that did not come from a box. 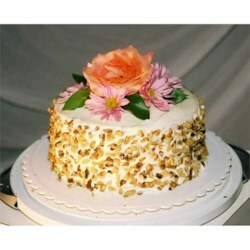 I made this for my daughters birthday and this carrot cake is Absolutely Delicious... I added 1½ cups walnuts because of person preference. Mmmm... Yummmy!!! I made this for my mothers 60th birthday. First time making carrot cake, everyone loved it. I did add a little nutmeg. I then used white chocolate cream cheese icing from another recipe.